Welcome to your home theater, a place where home entertainment and comfort becomes one, a place where the big screen takes your breath away, a place where Hollywood comes to you. 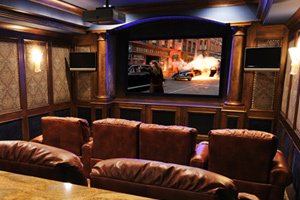 Techlife Media Systems specializes in creating the ultimate home theater experience. Combining your ideas with our suggestions and your dreams with our knowledge, we can design an extraordinary home theater that will be the envy of your friends and neighbors. Utilizing the latest proven advances in audio/video design concepts and equipment, our team can create the best a home theater can offer. From concept to reality, from projectors to theater room lighting, Techlife will cover all the bases and help you make the home theater experience one that is picture perfect.